Ansonia Clock Co., "Lever Gallery", ca 1904. 8 inch paper dial, original and pretty good. Dial says "8 Day Time". 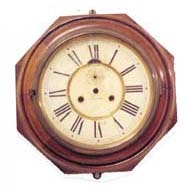 Brass bezel, dial rings.60% of the label remains on the back. Beautiful 11 inch walnut case, but NO MOVEMENT. Ly-Ansonia No.702.